You must be a valid member of MyNext Escape at the time of the prize draw. Only subscribed members will be valid in the entry draw. To sign up for the prize you must supply a valid email address, name, postcode and date of birth to validate that you are over 18 years of age and located in Australia to win the prize. All other profile questions are not mandatory however are asked and recorded so that MyNext Escape gain a clearer insight into our audience and the view of the Australian population. These insights are used to shape future content, prize draws and rewards. 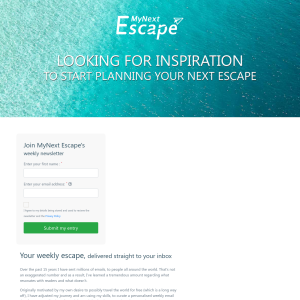 By subscribing to MyNext Escape you are consenting to join our community and email communications with opportunities to gain extra entries into our prize draw. You may unsubscribe at any time, however once unsubscribed you will forfeit your chance to win the prize draw. All existing MyNext Escape members are automatically entered into each prize draw. Competition commences 12:01am on the 1st of February 2019 and closes 11.59pm 31st of January 2020. There are 4 major prizes of $1,000 each, to the total value of up to $4,000. The prize will include a Flight centre voucher recommended to be put towards your next escape. The voucher may be spent on flights, accommodation, tours and activities available for booking through Flight Centre. The winner must book the holiday through the travel agent as appointed by MyNext Pty Ltd. The winner may choose their entire holiday structure. They will have the freedom to dictate holiday length, travel type, accommodation and activities. At MyNext Pty Ltd's offices, located at Level 2, 11 York St, Sydney, NSW, 2000 and will be randomly selected via computer. The winner will be notified by email and phone (if number provided) on the day of the draw and will be displayed on the MyNext Escape website, social media channels and via email. If the prize is unclaimed by 5pm 114 days after the draw, the winner will be redrawn at MyNext Pty Ltd, at Level 2, 11 York St, Sydney, NSW, 2000 at 12:00pm on the following day and will be randomly selected via computer. The winner of the redraw will be notified by email and phone (if number provided) and displayed on the MyNext Escape website and social channels.